THIS IS NOT A CONSUMER –WEBSITE, it is WHOLESALE-ONLY to licensed retailers, distributors and wholesalers. If you are a consumer and you wish to purchase our products please visit your local authorized retailer. We do not under any circumstances sell direct to individual consumers sorry! By clicking "I Agree" below you agree that you are over 19 years of age and are a retailer (store), distributor or wholesaler with proper documentation of such. NOTICE: ALL NON-MENTHOL FLAVORED PAPERS ARE ONLY TO BE USED WITH LEGAL NON-TOBACCO SMOKING HERBS AND ARE NOT TO BE SOLD FOR USE OR USED WITH TOBACCO. Welcome to Herbal Bar Industries. All Products of Herbal Bar are available to our customers. If you would like to become a customer please contact us at our toll free number: (800) 420-HERB . Our Pledge: We have been selling herbs and herbal blends since 1997 – long before the synthetic “Spice” problem. We have never added any chemical additives to any of our herbal blends – EVER. Back when synthetic “Spice” was selling strong this caused our sales to be very poor. Now that “Spice” is banned our sales of our natural herbs are strong once again. OUR HERBS AND HERBAL BLENDS HAVE NO CHEMICAL ADDITIVES, AND THEY NEVER HAVE. I have agreed not to sell synthetic cathinones, synthetic cannibinoids (also known as “Spice” and “Bath Salts”), and any substance that meets the definition of an “Analogue Drug” pursuant to 21 U.S.C. Sections 802(32)(A) and 813, to the residents and businesses of Yavapai County, Arizona. Moreover we have agreed never to sell any of these substances to anyone – ever – wherever they may be. All of our herbal blends are 100% natural and do not contain any chemical additives. They’re simply ancient natural smoking blends, similar to ones smoked for hundreds if not thousands of years by the Aboriginal people of our lands. PRESS RELEASE: Herbal Bar Industries is taking the Grow-Your-Own revolution to the next level. 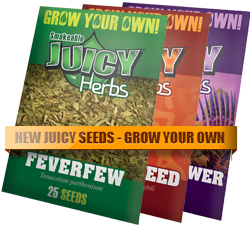 JUICY HERB SEEDS are now available for your customers. Each seed packet allows your customers to grow their favorite herb at home. Varieties include Feverfew, Mad Dog Weed, Marshmallow Root, Passion Flower, Purple Spearmint and Wild Lettuce. Each packet contains 25 seeds. These are high quality seeds guaranteed to give good yields. Ask your HBI rep about this innovative high-margin item! 100% NATURAL – NO ADDED CHEMICALS This product is not marijuana or synthetic marijuana. Skunk Brand has been a popular paper for several years and Skunkalicious is the leader of the pack. Was recently re-released to the fanfare of herbal smokers everywhere. It goes especially great with all Damiana based legal herbal smoking blends. New things happening at Herbal Bar. HBI is an eco friendly company. Through our relationship with FROGFILE, we use recycled printing paper and office materials, print our brochures on FSC certified paper with SHAPCO (an award winning low pollutant printing company) and use various energy-saving techniques in our offices, and even our homes. We also purchase carbon offsets to keep a zero-carbon balance. As the largest player in our market, we feel it is our responsibility to set a positive example for others to follow. A note about Juicy Jay's and other non-menthol flavored papers: In the United States of America, the current non-menthol flavored papers we sell are sold absolutely only for use with legal non-tobacco smoking herbs such as Buddah's Blend, Tribe, Sativah, Lovers Blend, Demonilia or Bulldog or with any other single herb or herbal blend so long as that herb or blend is legal and does not contain any tobacco. 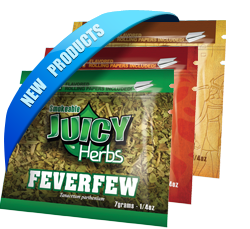 New Juicy Herbs are available to our customers! 100% NATURAL – NO ADDED CHEMICALS This product is not marijuana or synthetic marijuana.